Happy Friday and welcome to another creation for Family Fridays sponsored by Crazy About Cricut. Jenny, the head loco, has challenged us to create something with the kiddos which centers around their favorite Christmas gift or toy. Well...I chose my 13 y.o. for this project mainly because he was still awake. LOL!!! Seriously, I want all my kids to understand and be appreciative of everything they received. Our motto is, if you can't say say thank you, I can take it back. This year was tough for us. A friend at work heard that I was trying to get my son an IPOD for Christmas. She volunteered to bring him one for Christmas. I was so overjoyed. My son is the type that isn't at all picky. You should have seen him on Christmas. I hid it down inside some gloves. I had to keep telling him to dig. Dig deeper. He hollered when he found them. The rest is history. So...we wanted to thank her for being so kind and thoughtful. Her favorite color is purple so that's what we made for her. 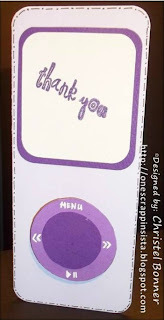 A purple IPOD thank you card. Enjoy!!! What a great friend! Super cute thank you!